Outsource2india provides expert Heat, Ventilation, and Air-Conditioning (HVAC) design and drafting services to meet the ever-growing need of our global clients. Helping construction houses, architects, engineers, and appliances designers and suppliers. We help you reduce your operational costs while helping you to stay ahead of your competitor. Our skilled drafters provide you with efficient and cost-effective HVAC design and drafting services that help you optimize your time and resources to carry out critical projects with ease. Outsource2india is a pioneer in HVAC design and drafting services with over two decades of experience. Our HVAC modeling and drafting team creates excellent 2D/3D models of your construction project enabling you to finalize these key elements for your buildings. Helping you a clash-free construction environment that ensures a higher level of safety and comfort, our HVAC design and drafting services help you improve efficiency, increase global footprints as well as improve your competitiveness. Taking into consideration all global engineering public health, safety and general welfare codes including ACCA (HVAC), ASHRAE (HVAC), AS (Mech. ), and AIA-drawing standards, we enable you to deliver smarter and safer building projects. Why Choose Outsource2india for HVAC Design and Drafting? When you partner with us for your HVAC design and drafting requirements, our team understands and plans the best way to deliver your project on-time and in a cost-effective manner. Our engineers accurately design the electrical, plumbing, and duct layout schematics as per the local municipal guidelines. When we design HVAC layout for your building, we ensure factors such as comfort and efficiency, and perform an HVAC design load calculation to determine a building's actual HVAC comfort system. At Outsource2india, we have over two decades of experience in offering HVAC ducting design and engineering services to global clients. Our team strictly adheres to deadlines and will ensure that you will have your project completed ahead of your schedule. So, if you have decided on outsourcing HVAC design and drafting services to India, you are at the right place. 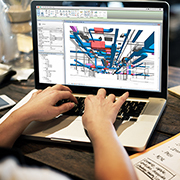 Partner with us today for HVAC design and drafting services and give your company a competitive edge.